The WET Brush: Hot in Color, Hotter to Retail! Looking for a Retail product that will bring extra profit to your Salon or Spa? One of the hottest products that Pure Spa Direct sells for retail is the WET Brush. It's hot in color and hot in sales! Our customers rave, "This is the most AMAZING brush!" for its 'Pain free' detangling. With its long, soft, flexible nylon bristles, it gently combs through hair without breaking it or irritating sensitive scalps. The WET Brush is perfect for use on wet, damp, or dry hair. This ouchless brush and massager is ideal for all hair types from thick, to curly, to straight hair. 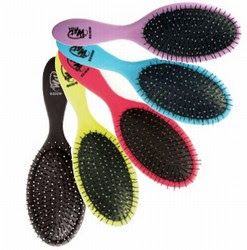 The brush is available in 5 assorted colors: Hot Pink, Purple, Black, Yellow and Blue -- one for every personality! Since I've used my WET Brush, I can't imagine using another brush. My long locks have less breakage and split ends than ever before. Who wouldn't want a brush that can detangle matted knots without jerking the head or causing your client or child to scream out in pain? Try it on your customers after their wash; they will be satisfied with the ease of not painfully tugging their hair out. The pleasant experience will have them hooked on purchasing the brush, all while telling their friends. • Integrated pick that allows for volume and lift. • Guaranteed not to break like most other paddle brushes. • Soft, rubberized non-slip grip for a secure, comfortable hold. The WET Brush is highly recommended for professional use at spas and salons, but more importantly if you’re looking for a way to make extra profit in hard times--> Retail it! At only $5.90 wholesale, and with a suggested retail price of $12.99, the opportunity for profit is +120% with each unit sold! Purchase the WET Brush today and promote a unique brushing experience for ALL!